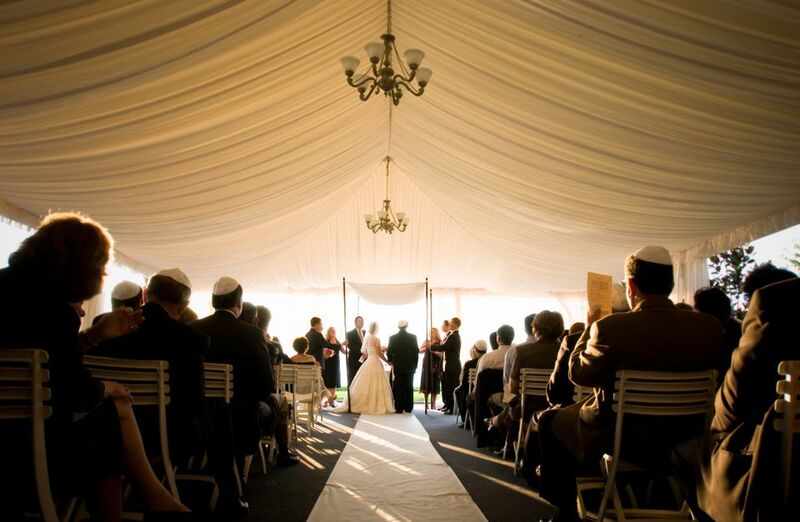 Jewish wedding readings are strongly tied to tradition and to the Talmud. If you're Ultra-Orthodox, your wedding readings will be limited to Psalms and readings from the Talmud. But if you're Reform, Reconstructionist, or another denomination, you may be able to incorporate some additional prayers, blessings, or readings. And if you're a secular Jew, there are wedding readings grounded in Jewish traditions that aren't religious. Blessed art Thou, O Lord our God, King of the Universe who hast created the fruit of the vine. Blessed art Thou, O Lord our God, King of the Universe who has created all things for His glory. Blessed art Thou, O Lord our God, King of the Universe, creator of man. Blessed art Thou, O Lord our God, King of the Universe who hast made man in his image, after his likeness, and hast prepared for him, out of his very self, a perpetual fabric. Blessed art Thou, O Lord, creator of man. May she who was barren be exceedingly glad and rejoice when her children are united in her midst in joy. Blessed art Thou, O Lord, who makes Zion joyful through her children. O Lord, make these beloved companions greatly rejoice even as Thou didst rejoice at Thy creation in the Garden of Eden as of old. Blessed art Thou, O Lord, who makest bridegroom and bride to rejoice. Blessed art Thou, O Lord our God, King of the Universe, who has created joy and gladness, bridegroom and bride, mirth and exultation, pleasure and delight, love, brotherhood, peace, and fellowship. Soon may there be heard in the cities of Judah and in the streets of Jerusalem, the voice of joy and gladness, the voice of the bridegroom and the voice of the bride, the jubilant voice of the bridegrooms from the canopies, and of youths from their feasts of song. Blessed art Thou, O Lord who makest the bridegroom to rejoice with the bride. My beloved speaks and says to me: Arise, my love, my fair one, and come away; for lo, the winter is past, the rain is over and gone. The flowers appear on the earth, the time of singing has come, and the voice of the turtledove is heard in our land. The fig tree puts forth its figs, and the vines are in blossom; they give forth fragrance. Arise, my love, my fair one, and come away. I am my beloveds and my beloved is mine O my dove, in the clefts of the rock, in the covert of the cliff, let me see your face, let me hear your voice, for your voice is sweet, and your face is comely. Set me as a seal upon your heart and seal upon your arm; for love is strong as death, jealousy cruel as the grave. It flashes are flashes of fire, a most vehement flame. Many waters cannot quench love, neither can floods drown it. If a man offered for love all the wealth of his house, it would be utterly scorned. I am my beloveds and my beloved is mine. Ruth said: Entreat me not to leave thee, Or to return from following after thee: For whither thou goest, I will go, And where thou lodgest, I will lodge. Thy people shall be my people, And thy God my God. Where thou diest, will I die, And there will I be buried. The Lord do so to me, and more also, If ought but death part thee and me. The Zohar, book of Jewish Mysticism Each soul and spirit, prior to it’s entering into this word, consist of male and female united into one being. When it descends on this earth the two parts separate and animate two different bodies. At the time of Marriage, The Holy One, blessed he be, who knows all souls and spirits, unites them again as there were before, and they again constitute one body and one soul, forming as it were the right and left of one individual. A New Seven Blessings from "The New Jewish Wedding"
We acknowledge the Unity of all within the sovereignty of God, expressing our appreciation for this wine, symbol, and aid of our rejoicing. From the Divine, source of all energy, we call forth an abundance of love to envelop this couple. May they be for each other lovers and friends, and may their love partake of the same innocence, purity, and sense of discovery that we imagine the first couple to have experienced. Secular Jews sometimes replace the traditional seven benedictions by asking seven close friends or family members to each give a personal wish for the marriage and the future. Others instead ask everyone to recite seven values they feel are important for strong marriages. Examples include trust, love, communication, honesty, respect, happiness, and compassion. Blessed is the wonder of creation, the earth, the provider of all things. May you be inspired each day by the abundance of the natural world, by science and technology, as well as art, music, literature, and creative expression. Blessed is the essence of humankind. People have the capacity for love and friendship, generosity, kindness, and compassion. May you express these qualities freely and be blessed to receive them throughout your lives. Blessed is the design of humankind. The diversity of humanity is remarkable: out of the same basic shape, infinite variations. May you find comfort in the similarities shared by all of the world’s cultures and celebrate the qualities which make us different. Blessed is the joy of this gathering. Despite its blessings, we live in a broken world. May you be blessed to live in a world where the there is food for those who are hungry, homes for those who are homeless, freedom for those who are oppressed, and peace and equality for all. Blessed is the joy of lovers. Today we celebrate with this couple as they freely unite in marriage. May you live in a world where this freedom is extended to all couples, allowing anyone to marry without judgment, impediment, or persecution. Blessed is the joy of gladness and celebration. With the breaking of the glass, today’s ceremony will end and celebration begin. As we shout “Mazel Tov” let us wish good luck for this couple and make this wish for ourselves and our loved ones: May every day be full of happiness, love, friendship, harmony, laughter, and rejoicing. Blessed is the human capacity for joy, embodied in the symbol of wine. The ritual of drinking wine at Jewish celebrations is an expression of joy and sanctification. May you find something to celebrate every day of your life, and may your cup runneth over. Praised be the enlightened one amongst humans, who understands that the world was not created for him. Praised be the one who is thankful for the evolution of humans. Praised be the one, who loves all humans as one's self, as one's very own self, and loves every human as one loves one's spouse. Praised be the one who is thankful for the evolution of humans. Let the barren (city) be joyful and exulted at the ingathering of her children into her midst in gladness. Praised be the one who shares in the gladness of Zion at the return of her children. Let us gladden the loving couple, (so they may enjoy gladness) like the legendary gladness of paradise. Praised be the one, who gladdens the bridegroom and the bride. Praised be those who increase, joy and gladness, bridegroom and bride, exultation, song, pleasure and delight, love and brotherhood, peace and friendship. May there soon be heard, all over the world, as in the cities of Judea and as in the streets of Jerusalem, the sound of joy and the sound of gladness, the voice of the bridegroom and the voice of the bride, the happy shouting of bridegrooms from their weddings and of young men and women from their song-filled feasts. Praised be the one, who causes the bridegroom and bride to be glad together. Praised be those who made this wine. Here's a sample secular wedding ceremony script. Looking for a different kind of wedding reading? Go to the full library of wedding readings.